For about three days in the moons cycle, she is hidden from our view in the night sky, this phase is known as the dark moon. It is a time of letting go, honoring dark Goddesses, and preparing for rebirth at the time of the new moon. A time of cleansing the self of negativities, letting go of things that hinder you, and recognizing the darker sides of our own lives. In the ancient world, the calendar revolved around the lunar cycle. The dark moon was the end of the month, and the new moon was the beginning of the new month. The Norse Goddess Hel is also a dark Goddess, called upon on the dark moon. She represents death as she is Queen of Underworld in Norse mythology. Her body was said to be half dead and half alive representing the balance in life. Of light and dark, those sides of ourselves, and our lives. Hel’s role in the Underworld is to decide the fate of the souls entering her realm. She can grant rebirth, but can also damn you to the depths of Helheim, her Kingdom. She can help you to shed the old, and prepare for rebirth, if you are ready for it. The dark moon embodies a chance to star over. To cleanse oneself, and be reborn in a sense at the new moon. Our lives flow in unison with the cycles of the moon. It can be bight and full, and then become dark and unseen. Just like the balance of light and dark in our own lives, and in nature. There cannot be light without the dark. 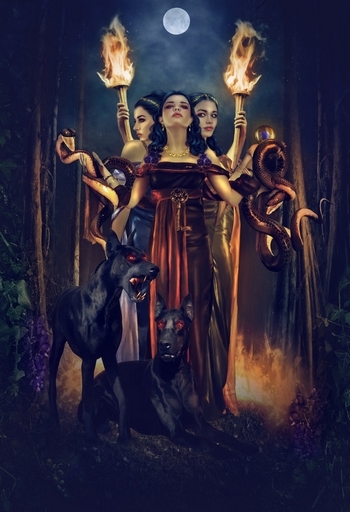 Wishing you all a blessed dark moon or deipnon if you honor Hekate! Click here to read the complete article and join her cute blog as well! This is a time for Sacrifice. In this, the time of first frosts and final harvests, this is a time of letting go and clearing away. This is a time of inner cleansing to make way for the justice of karma and a time for seeking shelter in friendship and community. In the calendar system we have provided as an example, this moon is typically named the Blood Moon. This name reflects the final harvest of livestock and the ultimate sacrifice of the harvest King as he leaves the world above for the mysterious transformation to be found in the underworld. In the Celtic Tree Calendar this moon is Ngetal (Reed) which runs from October 28th through November 24th. The Runic Calendar of Nordic traditions, (which is governed by half months rather than full months), divides this moon of the year by Wyn (Joy) from October 13th through October 27th and Hagal (Constraint) from October 28th through November 12th. 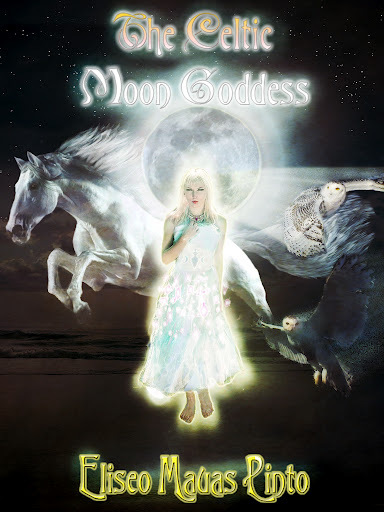 The Goddess Calendar names this moon of the year after Hathor or Samhain and runs from October 3rd through October 30th. The American Backwoods Calendar refers to this moon of the year as the Beaver Moon and is determined by whichever full moon falls in November. This is a time for moving beyond sacrifice to find the pathway to justice, balance and harmony. This is a time for moving beyond sacrifice to seek renewal. This is a time for moving beyond sacrifice to accept your place in the endless spiral of karma. This is a most appropriate time to lament all your losses. Just as the Summer King has sacrificed the fullness of the harvest to ensure the survival of his land through the coming winter, the aftermath of your sacrifices will provide the shelter of warm friendships to nurture and fortify your spirit through whatever darkness may lie ahead. Perhaps you know this as the Cold Moon, the Blood Moon, or St. Martin’s Moon. However you name this moon, you know it as a time of endings and beginnings. The necessity of accomplishing tasks before the coming winter makes them impossible is highlighted by increasing darkness and apparent decline. In this increased darkness the link forged between the world of the living and the world of the dead is strengthened just as the veil between these two worlds is pierced on All Hallows Eve, Samhain, The Feast of the Dead, all of which are celebrated on October 31st. In history it is the tradition to share of the Samhain feast with the spirits of the dead by leaving some out on the doorstep for the spirit world to enjoy. It was thought that the spirits would come masked and therefore giving to the masked has become a western tradition in this season. Today it’s the stuff that makes happy childhood Trick or Treat memories but in the old days this was a way to give or get charitable offerings without the humiliation of identification. New Moon people will make both powerful friends and enemies as their initial response is inclined to be impatient and impulsive. They will, however, maintain their position and achieve a great deal of respect, especially from their adversaries. Full Moon people plan their moves with more subtlety and achieve more recognition publicly, but they are inclined to want to move on to other things which can undermine their true sense of purpose. Generally speaking, Reed people are great survivors in life who are inclined to encounter the hostility of others rather than a helping hand. This is a time for moving beyond sacrifice to find the pathway to justice, balance and harmony. This is a time for moving beyond sacrifice to seek renewal. This is a time for moving beyond sacrifice to accept your place in the endless spiral of karma. This is a most appropriate time to lament all your losses, and then… move beyond them to let go. Just as the Summer King has sacrificed the fullness of the harvest to ensure the survival of his land through the coming Winter, the aftermath of your sacrifices will provide the shelter of warm friendships to nurture and fortify your spirit through whatever darkness may lie ahead. Perhaps you know this as the Cold Moon, the Fog Moon, the Blood Moon, the Beaver Moon, or St. Martin’s Moon. However you name this moon, you know it as a time of endings and beginnings. The necessity of accomplishing tasks before the coming Winter makes them utterly impossible is highlighted by increasing darkness and apparent decline. From the end of this season shall the beginnings of the next season grow. Just as all futures spring out of the past. Just as tomorrow emerges from yesterday. And so, we find ourselves on the threshold of this special moment of transition. The birds know it. The trees know it. The whole world can feel the Wheel of the Year turning from the season of Summer‘s light to the season of Winter‘s darkness. In this increased darkness the link forged between the world of the flesh and the world of the spirit is strengthened just as the veil between these two worlds is pierced on All Hallows Eve, Samhain, The Feast of the Dead. It is said that on this night, passage through the veil is eased and communication with the world of spirit is clarified. So, Sweetheart… since feasting is traditional, snuggle up here by the fire and I’ll throw another cup of something special in the cauldron while we wait for our very own feast to cook. We should also put some of our feast out on the doorstep for the spirit world to share. They will be masked so we won’t easily know them, but, giving to the masked is sort of customary in this season, isn’t it? Today it’s the stuff of tradition that makes happy childhood Trick or Treat memories… but in time gone by this was a way to give or get charitable offerings without embarrassing the needy by identifying them. Funny how traditions can change so much… and still hold on to some of their original meaning… isn’t it? .